Aspect’s friendly, trade-accredited engineers are on hand 24 hours a day, seven days a week to help with your heating and hot water problems, including boiler service and boiler repair. If you need help, don’t hesitate to give us a call on 020 8879 9600​. Winter brings with it a host of potential problems with the central heating in homes and business properties. The good news is that some of these problems are easily fixed, and don’t cost a lot to rectify. 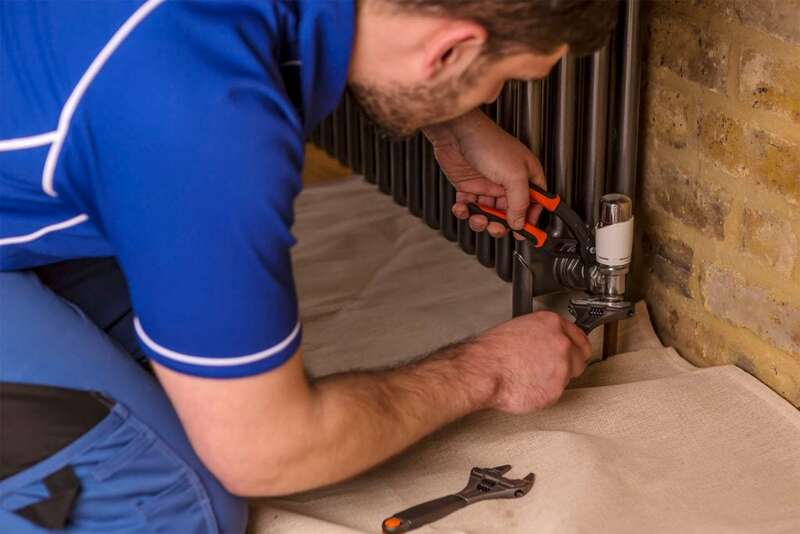 Learning how to bleed a radiator is one way of making sure that the radiators in your home stay in good working order, throughout the winter months and into the spring. Simple and relatively quick, it’s something every homeowner should to know how to do. Usually, if you need to bleed a radiator it will be easy to tell. Put your hand on the radiator and move downwards to check the temperature. If it needs to be bled, the top of the radiator will be cold and the lower half will be hot. This is because there is a build up of air trapped in the higher parts of the radiator, which is preventing it from heating up. If your radiator has been left untended to for a long time, you might not feel a huge difference in temperature from top to bottom – it may just feel a lot cooler than usual. You can check this by comparing it with the other radiators in your home – if they are all hot except for the one you’re examining, and the radiator hasn’t been turned down, then there is a problem and you’ll need to know how to bleed a radiator to fix it. 1. Once the warm water has entered the radiator, switch off your central heating system. 2. You will then need to locate your ‘bleed key’, which is supplied with all radiators. This is a tool which opens and closes the valve of your radiator. If you can’t find your bleed key, you can buy one in most large DIY stores or, as a last resort, you may be able to use a screw driver or pliers. 3. Insert the bleed key into the valve, which is usually located at the top of one end of the radiator. 4. Turn the valve key so that it opens the valve slightly. Only turn it enough to allow the air to escape slowly – if water begins to flow out, you’ve turned it too much. It’s a good idea to have a towel handy in case this happens. Protect your hands with a cloth, as air and water escaping could be very hot. 5. There should be a hissing sound as the air escapes. When the first drops of water have come out, you’ll know that all the air has escaped and it’s time to tighten the valve again. 6. You can now turn your central heating system back on to check that the radiator is functioning as normal and that there are no leaks. You may also need to adjust the water pressure by filling it up from the cold water mains as it could be affected by bleeding the radiator. These are the basic steps of how to bleed a radiator. If you are still experiencing a problem, you can call Aspect on 020 8879 9600​ for advice – we have a team of central heating engineers who are happy help.